dual and quad core machines are mainstream developer's desktop today. it was because of the disk access to IDEA's indices in system/caches directory. 240 MB. Plus I have a system/js_caches and system/jsp_related_caches but those are tiny. 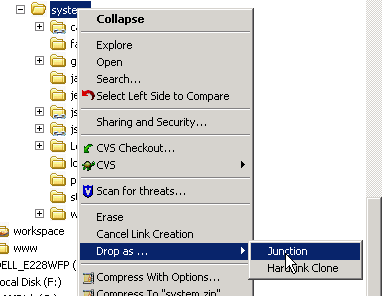 and then link to it using a symbolic link (called Junction in Windows XP). maximize the use of your dual or quad cores. I noticed a speedup in startup of IDEA and also when doing Find Usages. 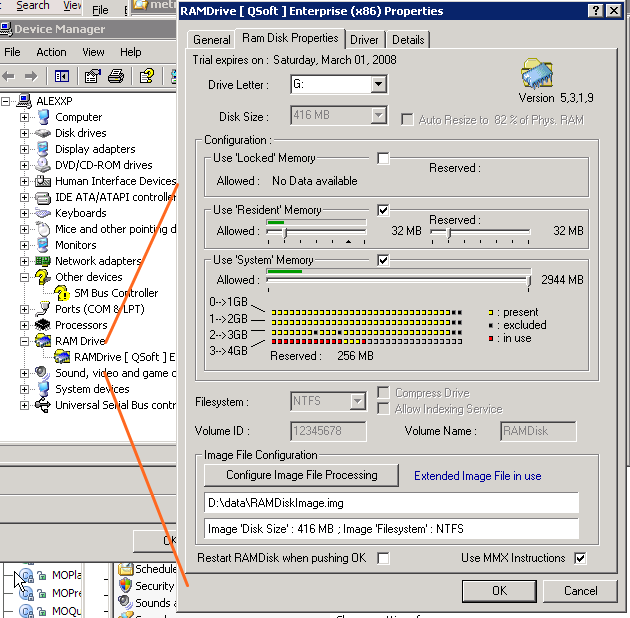 RAMDrive image is preserved between reboots. 2. Download RAMDisk "Enterprise (full)" Version 5.3.1. * for Windows XP. b. Set Disk Size larger than your estimated size of the caches, plus allow some room to grow. My caches were about 220 MB, and I used a ram drive size of around 400 MB. at startup plus save the contents of the ramdrive on shutdown/reboot. down. Then, when you log back onto the machine, you should see the contents back in the RAMDrive. 7. You're done! 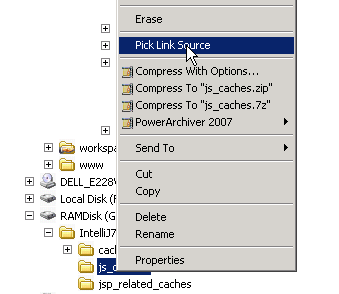 IDEA caches are now all in memory. Run IDEA and see (1) is startup any faster and (2) try a long "find usages" search and see if it is faster. Well, you didn't answered the main question - does Find Usages of all methods of the class use the 100% of all available cores now? If not, then you did fixed something, but not the original problem. projects. Also cache directories can be quite big. In my case - 878Mb. Btw, quad core processor(Q6600) is not always faster than dual core(E6850). I'm sorry I don't have some quantitative results. I did this one day over Thanksgiving break, and right now I don't have any more time to work on it. I thought I'd go ahead and post what I did since it seemed to have speedup up IDEA and maybe someone else, esp. someone with a QUAD core workstation, could try it out for us. 1) syntax/inspections parse after loading a file into Editor pane. Even before the RAMDrive, task #1 syntax and inspections parse appeared to use almost 100% of both cpus. This I would expect because it doesn't have to heavily access the indexes since syntax parse only concerns the file and the inspections parse within the Editor disables all global inspections. rigorous tasting, so take that with a very big grain of salt. I have been seeing Find Usages not fully utilize both of my cpus, and so I was trying out this RAMdisk to try to eliminate Disk I/O as a cause. I have a suspiciion that there mayb e an inefficiency of how IDEA divides the subtasks may not keep both cpus busy. I was hoping Jetbrains would do some of there own tests to show the performance gains while running IDEA on dual core or quad core, since I think that would be a powerful marketing message for professionals, but I haven't seen anything from Jetbrains on the matter. I just hope that Jetbrains engineers are all running QUAD CORE workstations; If you give them the horsepower, I'm sure they'll figure out a way to harness it! The only areas the RAMDrive made faster to me is startup and doing find usages. I suppose other tasks like Analyze Dependencies would be faster too, but I haven't run those yet. I did notice a speed boost, but Your Mileage May Vary (YMMV) depending on your system. If you don't have lots of free memory, then reserving memory for the RAMDisk could cause your system to thrash the page file, which could end up slowing your system. In my case, I had 4 GB memory, and I wasn't using all of it. Sergiy> Also cache directories can be quite big. In my case - 878Mb. You might try wiping out your cache directory and letting it rebuild. My cache directory was originally 500 MB, but when I rebuilt it was only 224 MB. I think there were alot of unused indices from old projects or copies of my projects and/or due to EAP cruft. Sergiy> Btw, quad core processor(Q6600) is not always faster than dual core(E6850). Right, but that E6850 is at a higher clock speed. I agree if you are buying a new box, I would prefer higher clock speed dual core over slower quad cores, but for the same clock speed, I would expect QUAD core to run IDEA faster for these long tasks like find usages, analyze tasks, etc. as long as IDEA can split the work into 4 tasks. Since all of these tasks I'm talking about are read only, there shouldn't be much synchronization or locking problems, so I would think all threads should be able to run at full speed. I suppose memory contention could be a limiting factor. Tom's hardware always has good CPU comparisons. I like to look at the Application Performance charts, e.g. WIith AMD introducing their Phenom QUAD core chips, I expect QUAD core chips to get much cheaper next year. I read the review of the Hyperdrive 4 SDRAM drive, and that thing is like greased lightning! The SDRAM drives are still very pricey, but Flash based Solid State Hard Drives have dropped in price. You can get a 32 GB flash based hard drive for several hundred dolalrs. I think a internal SATA Flash drive or SDRAM drive could be the ideal solution if your IDEA cachefiles are very large, i.e. more than 500 MB. Might be another year or two before the price gets cheap enough, though. If I built a new box today, I would still go with a SATA or SAS 10k drive. multiple files and Find Usages tasks. workstation, could try it out for us. the subtasks may not keep both cpus busy. them the horsepower, I'm sure they'll figure out a way to harness it! SMP Seesaw is a utility for dual-CPU or dual-core computers that controls how Windows balances the compute load between the two processors. By default, Windows balances the processing load to both CPUs as evenly as possible among all programs. SMP Seesaw provides a convenient means to change the processor affinities for all running programs at once. In particular, the most common use is to dedicate one of your processors to a single program, thereby improving the performance or responsiveness of that program. While the regular version is for dual-core systems, there is also a "Pro" version (also free) that supports up to 32 CPUs and has more options, and a SDK. I only recently came across this utility, and have not had a chance to try it out, (and may not get a chance to for a while). But it might be useful to improve performance. If anyone's tried it, please let us know your experience.